During the end of days of WW11 War criminals were secreted out of their respective countries & relocated to various parts of the world via a ‘ratline’ organised by the Roman Catholic Church & funded by the Vatican bank, officially known as the Institute for Religious Works. 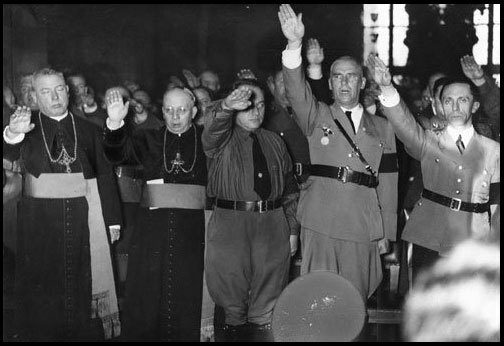 Established in 1941 by Pius XII or Hitler’s Pope, the Institute for Religious Works became the bank of choice for Italian fascists, the aristocracy & the Mafia. The Holy See is the official government of both the Roman Catholic Church & Vatican City State, a micro-state that runs independently from the rest of Italy. It is also the temporal government of the world’s 1 billion Catholics, & is ostensibly involved in tax evasion, financial scams, & money laundering of Nazi Gold. Officially the Vatican Bank was created during World War II to administer accounts held by religious orders, cardinals, bishops and priests. However from its inception the bank has been involved in numerous scams, scandals & plots. The bank claims to have no records of its operations during the Second World War period, though records from German & American sources show Nazi transfer of funds to the Vatican bank from the Reichsbank, & transfers from the bank to Nazi controlled banks in Switzerland. Documented are transfers of undisclosed amounts of gold from SS accounts to an unnamed bank in Rome in September 1943, which moved to Milan to avoid seizure by the allies. 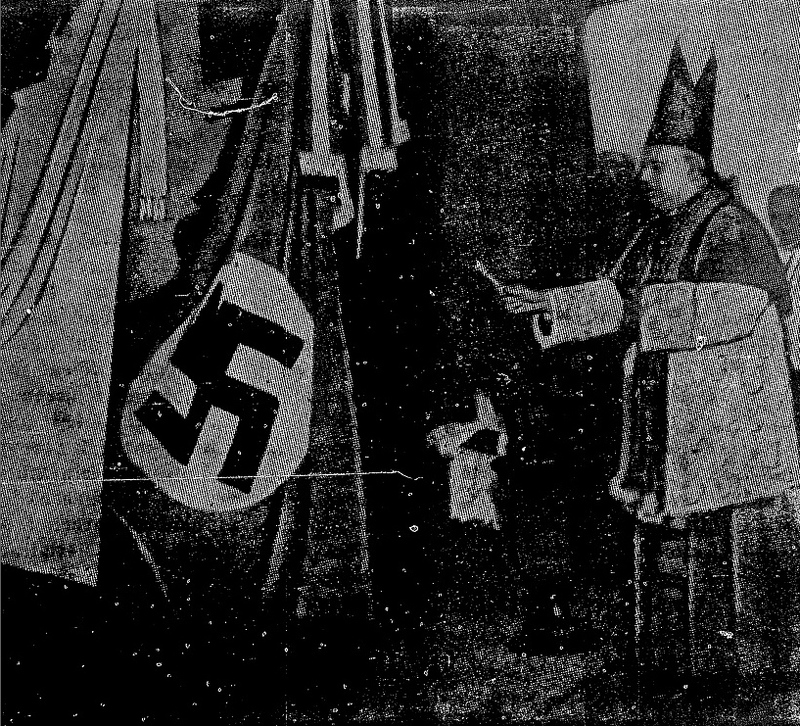 Due to the intervention by the Church Nazism survived the war, as an organised, influential and well-funded political and technological engine. The acquisition of Nazi Gold fattened the treasury of the Pope’s bank, the extent of which was buried at Catholicism’s most holy of shrines, Fatima, Portugal & said to be controlled by Masonic elements. The bank was also instrumental in the disappearance of the Croatian treasury, a puppet state of the Nazi’s which was estimated at $200 million. The Croatian Nazi’s, the Ustashe were catholic extremists who’s religious convictions included the genocide of 500,000 Christian Serbs & tens of thousands of Jews & Gypsies. Assets seized from their victims were banked with the Vatican bank to fund their government-in-exile in Argentina & to send their members along the ‘ratline’ to South America. Argentina becomes a major player in the post war survival of Nazi ideology. CIA & US Army Counter-intelligence reports tell how in the last days of WWII a Croatian treasury convoy headed for Austria, was intercepted by British officials. Money changed hands & the remainder of the treasury was allowed to proceed to Rome. Finding its way to the Vatican bank & the services of the holy See, the treasure was siphoned through to disparate accounts & disappeared. The Vatican Bank deliberately ignores anti-laundering laws with the aim of hiding the ownership, destination and origin of capital. Documents reveal that clergy have acted as fronts for corrupt businessmen and Mafia. The Vatican bank is never audited; funds deposited there may simply vanish without a trace. The relationship between the Utashe & the Institute for Religious Works continued well into the 1950’s. 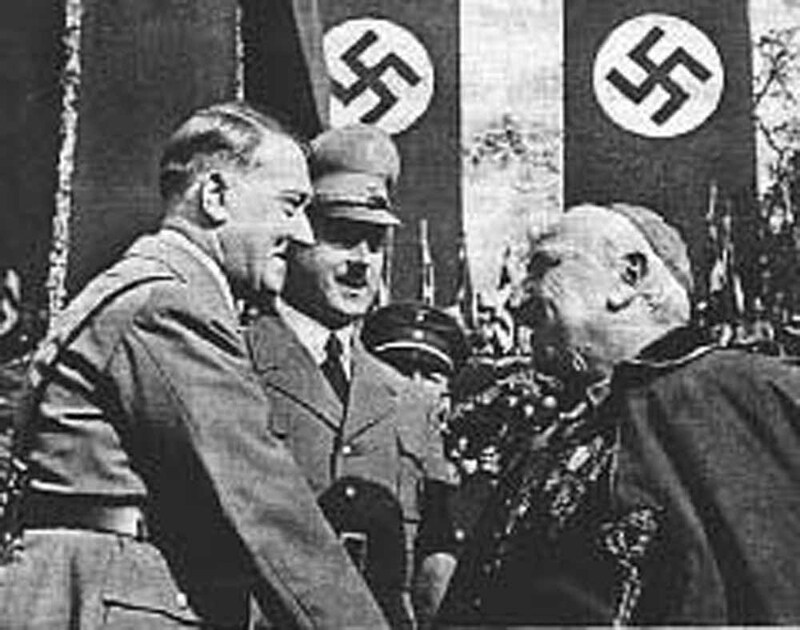 The Ustashe leadership were sheltered in monasteries all over Rome along with fellow Nazi‘s & met frequently with high church officials. The Vatican ‘ratline’ had help deliver 10’s of thousands of Nazi war criminals & sympathists out of Europe to Australia, South America, South Africa, Papua New Guinea & elsewhere. The various elected Popes became moneychangers, people smugglers & saviors for the perpetrators of the holocaust. The War was nothing less than a carefully orchestrated plan for the establishment of an Israeli State in the Middle East & a pretext to usher in the precursor to Global Government in the guise of The League of Nations. The Vatican Bank continues to cement its reputation as a dubious enterprise, filtering bribes to politicians, extorting money from the poor & aiding & abetting in the laundering of moneys acquired through extortion, fraud, & criminal activity. CIA & US Counterintelligence reports indicate the Bank has been infiltrated by the Mafia & the Freemasons, & continues to support subsidiaries such as the extremist Catholic cult of the affluent Opus Dei who are under criminal investigation. & its reach spreads right around the world. Because of his close association with the Holy See Italian banker Roberto Calvi was labelled “God’s Banker”. Calvi was Chairman of Banco Ambrosiano, which dissolved in one of Italy’s biggest political scandals, and wound up dead in London in June 1982. . His death, a source of enduring controversy was ruled a murder after two coroner’s inquests and an independent investigation. implicated in Calvi’s death were the Vatican Bank, Banco Ambrosiano’s main shareholder; the Mafia, which may have used Banco Ambrosiano for money laundering; and the Propaganda Due or P2 masonic lodge. In 1982, after warning the Pope of Ambrosiano’s imminent collapse, Calvi fled Rome on a false passport. He was found swinging by his neck off Black Friar’s Bridge in London’s Financial district. 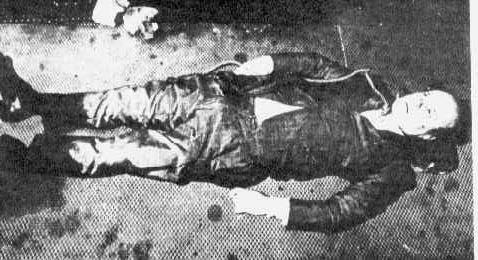 Calvi’s clothing was stuffed with bricks, and was carrying around $15,000 cash in three different currencies, while his secretary Graziella Corrocher threw herself out of the 5th floor window of the Banco Ambrosiano . Through correspondent banking relationships the Vatican bank operates through prestigious banking giants like the Republic Bank of New York, Bank of America & J.P. Morgan Chase. Since correspondent accounts do not subject a bank to the host country’s judicial jurisdiction, the bank operates with impunity, doubly protected by its claims of sovereignty. Very little is known about the Institute for Religious Works by banking experts & the bank has yet to be held accountable for its wrong doings, due to the secrecy that shrouds its operations.